Pitlochry is such an invigorating and relaxing place to be that even Queen Victoria came on holiday here in 1842 and remarked on how fresh the air was compared to the London smog. Since then it has become a very popular place for spa breaks and for walkers to recuperate after a long day of exertion in the surrounding hills. With its fresh air and Victorian grandeur, Pitlochry is a great place for unwinding and entertaining, and with our varied menus that are always freshly-prepared on-site, the Hog Roast Pitlochry are the perfect catering choice to help you do both. There are so many enchanting places in the area in which to host events, and thanks to our versatile approach, we can provide you with great food wherever you choose. Whether you are looking for indoor opulence or outdoor fun, we have an extensive range of menus for all occasions and we always adapt our service style to suit your needs. If you are longing to recapture the Victorian elegance of the Atholl Palace Hotel in its heyday for your wedding reception but you are struggling to find a catering option that meets the diverse dietary needs for your guests, Hog Roast Pitlochry is the answer. 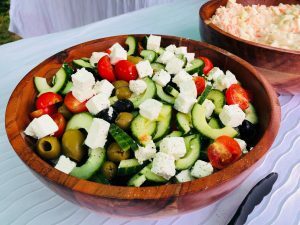 We can provide vegetarian and gluten free dishes as part of our sophisticated wedding menus, complete with canapes and table service and treat your wedding party to an elegant meal that everyone will love. Alternatively, if you are planning an outdoor event and need a large buffet of fantastic locally-sourced food, we have the capacity to feed up to 300 people with just one of our hog roast machines and we would be in our element serving a large crowd under the rather unique iron canopy that stretches over Pitlochry High Street. We are also a great choice for combining business and pleasure with our impressive array of corporate catering menus and there is no better way of rewarding your employees or winning your clients over than by treating them to some of our delicious slow-roasted pork after a company conference or whisky tasting event at one of Pitlochry’s distilleries. Whatever you need, the Hog Roast Pitlochry team have got it covered with our professional service and personal touch.